For a few seconds following our October federal election, which resulted in Stephen Harper winning a stronger minority government, I wondered if maybe, just maybe Harper might actually put some effort into trying to work with the other political parties rather than simply attempting to bulldoze them. Then the world economy collapsed and I hoped again that Harper would rise above his dictatorial tendencies and, you know, concentrate on throwing out a helping hand to Canadians suffering during the current financial crisis. But nope, same ol' Steve-o with a murky shadow agenda constantly at hand. Yesterday I received an email from the Green Party explaining that the Tories were expected to announce the cutting of public subsidies to all federal political parties. Later in the day they indeed made such an announcement. 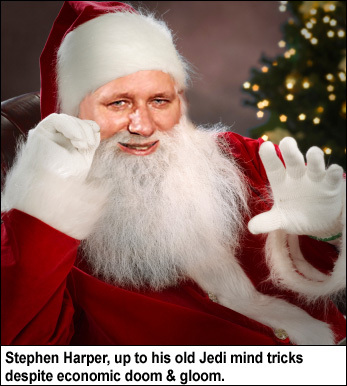 Prime Minister Harper, I'm sure, would like us to see him as Santa Claus (benevolent and generous of spirit) for nixing the anti-democratic proposal but notice his gloved hands in the above photo, still trying desperately to conjure the Jedi Mind trick which he hopes could place the entire nation under his thought control. Well, it might just be too late to stop that non-confidence motion now. For once, the opposition aren't taking Harper's oppressive tactics sitting down. See, the thing is, Stephen, mind games aren't going to create any new jobs and help us weather this raging economic storm. Somehow, even now that the government's on the verge of being toppled, I doubt you're anywhere close to understanding that.